Your not "trapped" in a trapezoid wall! A Nautical Chart mural brings it life! You would be surprised to hear how many people have talked to us about a weird wall in their home that they had given up on because it was, well, weird. But we have turned the strangest walls into spectacular murals. All it takes is a little imagination, and you might just be surprised at what works for a nice nautical chart mural location these days. Will Berson is a great example. His wall of choice is a trapezoid. Yep, you remember the trapezoid from your geometry class. But Will wanted a mural showing off his cool location on the New Jersey Shore. And he wanted it positioned so that the window in the middle of the wall didn't cut into his favorite areas. The picture above is what we did for him. And what about stairwells? Not a typical rectangular wall, but they make for some of the most interesting murals. They aren't the easiest to design, but let us help you and the results will look marvelous. The key to a good stairway mural is realizing that your focal point will change as you ascend (or descend) the stairs. And if you are comfortably seated in the room, viewing the stairs, the view should be interesting as well. Another very common "weird wall" is the wall with a sloping ceiling line. In a room with such a ceiling, your eyes tend to drift upwards with the line of the ceiling. This natural eye-path can actually work well when composing the layout if your mural has a similar eye-path. But for most walls, the focal point should be about five feet above the floor to match the location of the eyes of most people who walk into the room. We have done a number of ceiling murals lately, and some of them have unusual shapes such as this octagonal, recessed ceiling. So let us help you make that wallflower of a wall be the center of attention. Give us a call or text to 801-367-7945 or go to our "Contact" page and fill out a short inquiry. We will give you a free price quote, and even help with a potential layout -- no obligation to buy. Remember, no wall is too weird to love! We were delighted to be commissioned to do a mural for the South County Tourism Council in Charlestown Rhode Island. This is a beautiful, visible display of our work, and if you happen to be in the area, please stop by 4160 Old Post Road in Charlestown RI to see it. As a reminder, if you have a public area for displaying one of our murals, and are willing to place our cartouche on the wall, you can be eligible for a $200 rebate on your order. Our promotion, good throughout 2018, is bringing in new public places for people to see our nautical chart murals. Our goal is to have at least three public locations with our murals in every state along the east coast and west coast of the US. This is the first for Rhode Island, and we are grateful to the South County Tourism Council for making this happen. How about your restaurant, hotel, public office, marina, or yacht club? If you have an empty wall that could use some pizzazz, then this is your year for a mural! Call us at 801-367-7945 and let's make it happen! What Color is this horse? Actually there are several colors if you look carefully. Now we have a tool to help you! Often in working with murals, our clients would like to see a different color treatment than what is seen in your average NOAA nautical chart. Which is just fine with us; we change colors in charts all the time. But there are some "color cautions" that you need to know. 1. There are a LOT of colors out there! Depending on what scientist has the microphone, the average person can see somewhere between 1 and 10 million colors. And how we perceive color depends on the configuration of cones in your retina. 2. Source of light can significantly change how we see color. Tungsten, fluorescent, LED, sunlight are all types of lighting which can make a difference in how our mural colors appear, and how they may or may not match existing color elements in a decorating scheme. 3. Beware of online "swatches" of color and their "digital recipes." Your computer screen can change how online color can look, and make you think a color will appear a certain way when in reality, it is quite different. The ColorSnap is less than $60 and is the best decorating buy you will make. 4. And to complicate things further, the digital coding (hex codes, RGB, etc.) will often vary significantly from what you see online. Have you lost hope of finding your true colors yet? There is a way to achieve some success, but your will need some new tools. One is an old tool -- a paint color deck -- and the new tool is magnificent. It is called ColorSnap, and it is about the size of a C Battery. Let's say, like the little girl in the photo by Lucie Hošová on Unsplash.com, you love this horse! In fact, you love this horse's coloring, and want to come up with a paint color to match good old dobbin! Well, instead of breaking out the color swatches, you buy this cool tool called ColorSnap from your local Sherwin-Williams store for about $60. Now, go to your smartphone and find the free ColorSnap app and load it onto your phone. Make sure the bluetooth of your phone is on. Your next step is to press the button on the ColorSnap which will turn it on and communicate with your smartphone app. No batteries needed; you keep ColorSnap charged with a USB port. Once you calibrate your ColorSnap, place it on the color you are seeking and hit "scan" on your app to display your color. You will next be asked to "awake" ColorSnap by pressing the button on the top. A blue light blinks on, and your app senses it and asks you to calibrate by putting on the cap on ColorSnap and calibrate the white color inside the cap. Now you are ready to find out what color this horse really is! Remove the cap and put the Color Snap on the horse's picture and then click on the "Scan Color" button on your phone's app. Immediately the correct color appears, and even lists the correct color for Dobbin's furry face. Immediately I learn that Dobbin's nose is Sherwin-Williams' Coral Island 6332. Think of the fun you will have! You can walk up to the house on the corner whose outside paint you covet, place ColorSnap on the side of the house and walk away with the color recorded in your app! Working on your suntan? Measure the tan on your arm and boast about your latest epidermal shade in your next Facebook posting! The world is your coloring book! But back to the subject of color changes in murals. There is one piece of solid color advice I want to give you, and it is this: Pick the colors in your chart mural BEFORE choosing your paint for the same room as your mural. Once the mural arrives THEN get your ColorSnap out and use it on your mural colors to pick other colors that will look well with your mural. And please, don't try to match exactly the chart color. Just find something of a similar but different color that will compliment your mural. Do this and you will be universally heralded as the quintessential, chromatically-conscious decorator. Now let's get busy and get your mural ordered, okay? Quiz Time: Can You Pick GOOD Wallpaper Ideas From Bad? This year has been a banner year for Nautical Chart Wallpaper. To find out why, lately I've been asking potential clients where they first heard about us. The answer surprised me. You won't believe what I've learned. But to help, I would first like to give you a pop quiz, just three questions long. Ready? Scroll down for the first question. Which of these is a good nautical chart mural? A or B? Now, question two: Which of the next two is the best nautical chart wallpaper? Finally, a tricky question to conclude our quiz. Which is the bad wallpaper idea? Pencils down! Let's grade your quizzes. If you answered "A" to all three questions, you are indeed an A student in the Interior Decorating Arts. Which of the two murals is easier to look at? Or, which mural do you find more interesting? The Mod Podge mess that passes for wallpaper is a temporary fad at best. Charts and maps are made to be charts and maps, not wallpaper. Maps applied as wallpaper will often bubble, do not stay well-adhered to the wall, and from what I've read on the web, many users have resorted to thumb tacks, tacking or (groan) stapling their chart pieces to their walls when peeling inevitably begins. And don't forget -- Mod Podge will discolor soon, turning the chart "wallpaper" an unflattering yellow. As the quiz should have demonstrated, Mod Podge maps as wallpaper just look bad. And I mean really bad, disjointed, conflicted, and convoluted. So save yourself some grief and let us help you with a mural that fills your wall with one, meaningful, enlarged image printed on our moisture friendly, mildew resistant wallpaper -- and treat your room to a professional look. Now for the answer to why our business is so good lately? The arts-and-crafts crowd has now seemed to realize how temporary their paste-the-chart-on-the-wall really is. They liked the idea of nautical charts on the wall, and whenever they look for a company to do the wallpaper professionally, we show up online, near the top of the search engines. A similar phenomenon has happened to us before, when Ralph Lauren cancelled their nautical chart wallpaper, and we got several referrals from folks looking for their paper. Now it is the arts-and-crafts crowd seeking a more permanent solution for displaying nautical chart murals in their home or office that brings them to us. In any case, regardless of how you found us, we are delighted to help you achieve your mural ideas. Call us at 801-367-7945 or contact us online and let's talk about your project! I can help my clients create murals for another 14 years and I'll never get over how clever they are on their home decorating ideas. A good example of this is Rhonda, who knows how to make her mural come alive with lighting and color. The lighting is simple: a little lamp with a lampshade that matches the color of the land and a beautiful base the color of the cabinets below -- tying it all together. We love to help with large murals, of course, but a small mural can make a big impact if you have the right place for it. Rhonda did, and you can see how very splendid the result was. I'd also like to share a view from Rhonda's home that she shared with me and believe me, this photo would make a wonderful mural! Time to take another look at YOUR nook? Finally! A Mural For Me! My wife has always joked with me that I'm like the cobbler who is so busy making shoes for everyone that he never makes them for himself or his family. She happens to be right! Out of the hundreds of murals I have made for my clients, I never have made a mural for my walls -- until now! I have always loved the San Juan Islands, located in the northwest corner of Washington State. Since the 70's, I've chartered sailboats there and taught several people to sail larger boats while having a splendid time on their vacation. For my mural, I wanted to change the color of the land to go well with my light green office walls. I changed the color to Garland Green (Sherwin-Williams). I also changed the dark magenta shipping lanes to a more eye-appealing SW Sapphire Ice. I also wanted to "frame the mural" but do so with a rope border. I changed the color of the silver rope to a SW Silken Moss for the dark brown, and SW Green Tea for the light brown. The rope border presented a challenge. As my clients will tell you what I tell them, "we can only print in rectangles." This is true of the mural with a rope border, but this graphic rope, which looks like the old three-strand line, has contours all the way around the mural. I didn't want the background to be white, so I had to get a small pair of scissors and trim the white away from the rope. Now, when it is mounted on my light green wall, the rope will stand out and enhance the framing of the chart. Another feature we wanted to add was our cartouche. This is the freebie that we offer all our clients to show their role in designing their mural. We positioned ours in the lower left-hand corner of our mural. A modern version of the cartouche has been a regular option for our clients for some time now. We think it is a lovely way to give credit where credit is due: to our clients who first imagined a nautical chart mural on their wall. Just to be clear, everything we do is a custom mural for each client. The idea is to give our clients the exact mural they want on their walls. Of course, the bigger the wall mural, the more expensive it is. But what about our clients who are on a limited budget? Is there a mural in their future? The answer is yes, and further, a small mural can still make a big impact in your home or office. Here is one example. The mural of Cape Ann is an important one to our client, but where would it make the biggest impact? The answer in this case was on a bathroom wall. A 5' x 4.5' mural similar to this is just $395. Shipping is free in the US. The client kept the colors that NOAA charts come in and we did a mural centering Cape Ann on the wall. Notice how the tiles pick up the green and beige in this mural. But it is what the client did in modest decorating that really added to the mural. Note in my second picture how the colors of the starfish tile matches both the tidal flat green and the beige land color. The shower towel is even flattering to the mural! Point is, budgetary concerns should not stop you from having a nautical chart wallpaper mural in your home or office. And the bathroom decorations can easily add to the effect by careful selection of color and seagoing theme. Want more ideas? Just give us a call at 801-367-7945 or send an inquiry to skippersteve@gmail.com and we'll work with you to get the "most mural for the money." To Vector Or Not To Vector -- That is the Question! We love to create big murals. The bigger, the better, and frankly we do a better job of enlarging murals than our wanna-be competitors. Fourteen years of doing nautical chart murals does have its advantages. Longing for Long Island? A BIG mural will help! We LOVE to create giant murals! But enlarging murals from NOAA charts into a nautical chart wallpaper mural sometimes has it's problems. Can a chart be enlarged so much that it becomes too jagged with pixels? Well, yes! And when that happens, the solution is to use a vectored file, which we can also create. To begin the discussion, consider the following two images. This is from an actual job we did for a client in the Boston area. They wanted a fairly small part of the chart to be enlarged to nearly 15 feet in height. These images demonstrate that a rasterized image (first image shown) may appear too jagged when one or two conditions exist. 2. When the mural wall is so large that the image will be jagged no matter what we do. But there is a price to be paid for vectoring an image such as the second image demonstrates. Numbers tend to be tapered at the ends. The image isn't quite like it appears on a NOAA Chart. A vectored image is composed of tiny triangles of image which allow enlargement without significant loss of quality. If your wall is gigantic, vectoring is likely the only option. So how do you know if you need to go with a rasterized image or a vectored one? Well there is a way you can check. Or we can do it for you if you like. Let's say that you have a chart that you like but only want a portion of that chart on your mural. So you crop the chart to the approximate image you want on your wall in your favorite graphics program. Next, be sure your program's rulers are displayed, especially the vertical ruler. In this example, your newly cropped image is 5 3/4 inches high in your program, or 5.75 inches. Your challenge is to see if the mural will look good on your mural wall happens to be 8 feet in height. Is that too much to enlarge? Let's find out. Because your wall is 8 feet high, let's divide your chart image that is 5.75" high by 8. So 5.75 ÷ 8 = 0.71875 which is between 11/16ths of an inch and 3/4 of an inch. Crop your image down to 0.719 in your graphics program. We are doing this to yield an area that will equal one foot in height of your mural. Now enlarge the resulting image until it measures exactly 12 inches high on your screen. You can check it with a 12-inch ruler as the illustration shows. Tweak your graphic's program magnification until it matches the ruler. On my program in this example, the magnification was 220% to get the screen image to match my 12-inch ruler. At this point, back up from your screen about 18 to 24 inches. Do you like what you see? If so, then you don't need to vector your image. But if the image appears too jagged, well, you need a vectored file and that's what we're here for! We'll vector your file, change colors and do whatever is need to give you the nautical chart mural of your dreams! Just call us a 801-367-7945 and tell us about your project. We'll tell you what it will take to make your custom mural dreams a reality! When Jeramy Larson told me that he and his friends were opening a bar and were considering a nautical chart mural of San Diego Bay, I wanted to be a part of the project! Jeramy's idea was exciting. The name of the bar was "Goodbar" and he wanted to make the nautical chart pop with color, show off the San Diego Bay, and put his bar on the map -- literally! The logo of Goodbar is an octopus wearing a diving helmet. For certain, the octopus had to have a prominent place on the chart. The color Jeramy and his friends chose for the land was Benjamin-Moore's Nottingham Green, with Georgia Peach denoting the Naval yards. Other color changes were also made to complement the green land without losing the nautical effect of a NOAA chart. But when I learned that he wanted to install it with his friends, I must confess, my blood ran cold! I have always counseled ALL of my clients to go out and find a paperhanger who has hung wallpaper commercially. Reason? It is not easy to match latitude lines, do a one-inch overlap and a double cut to match the edges. This is the sort of thing you really want a professional to do. The San Diego Goodbar Gang, just "hanging around" -- a Nautical Chart Mural, that is! So what did the San Diego gang do? They ignored me and decided to hang it themselves! As you can see in this picture, they had a wonderful time doing it, with a couple hanging a panel while others pasted the next panels to go up immediately after a panel was in place . Then came a phone call to me. Jeramy was worried we didn't have enough paper! I ran to the calculator. Allowing for the extra for overlaps, it should work out. Jeramy wasn't so sure, but he hung up and got back to wallpapering. I, however, paced the floor. Did we have bad measurements? Finally another call. "We had just enough and it fits perfectly." A collective sigh of relief was heard in both San Diego and Post Falls Idaho! From that point on, I now add even more extra inches the larger the dimension happens to be. I don't like close calls. Neither do my clients. But the good news is that our mural was up looked fantastic, and really added to the atmosphere. Jeramy said his contractor couldn't believe he and his partners hung the mural themselves. Jeramy Larson, and his sidekick Ralph, admire the Nautical Chart Wallpaper mural. A good dog likes Goodbar! So if you are in the San Diego area, be sure to stop by Goodbar at 1872 Rosecran in the Point Loma part of San Diego and enjoy a tasty libation while marveling at the amazing mural over the shuffleboard table. Then give us a call and we will order a mural for you! It's Goodbar . . . and a good mural as well! A Big Mural . . . That's The Ticket! When I'm not helping clients design their nautical chart wallpaper murals, I do have other interests. Sailing is one of them, but music is a powerful interest. I loved The Eagles, Neil Diamond, Moody Blues, The Grass Roots, The Rascals, The Turtles, Bachman Turner Overdrive, Johnny Rivers, Three Dog Night, and Tommy James and the Shondells. And of that group, I have heard all of them in concert. All, that is, except one: The Eagles. The Eagles in concert, making magic with their guitars, voices, and memorable songs. For years I've wanted to hear The Eagles in concert, but was never around when they had their concerts. But this year, The Eagles are coming to Spokane, Washington, just 25 short miles west of where I live. Naturally, tickets sold quickly, and I ended up driving to Spokane to buy my tickets at the Spokane Arena Ticket office. I ended up paying more for two tickets than I had for any concert in my life. If I arrived at the ticket office any later I would have probably needed a co-signer. Anyway, when I fulfilled that missing goal of Eagles tickets, I turned away in line and caught a sight near and dear to me a HUGE mural! This one, on the wall of the ticket office, was a rendering of most of the ticket seat numbers in the Spokane Arena. And suddenly, I have another goal. I want to create a mural for a ticket office somewhere in the world. A great way to find your seats before purchasing them is spotting them on this mural. As nice as this mural is, I know I can do a better one! Any ticket office managers out there interested in a marvelous custom mural? I'm your guy! Call me at 801-367-7945. When I first began Nautical Chart Wallpaper 15 years ago, I realized that I had a major problem. I had a splendid product and a marvelous idea of creating wall murals from a nautical chart. However, potential customers could not see them as they were created for private homes and were not in any public places. Yes, we had pictures on our website, but that is certainly different than being able to walk up to a nautical chart wallpaper mural and actually see it firsthand and even touch it. 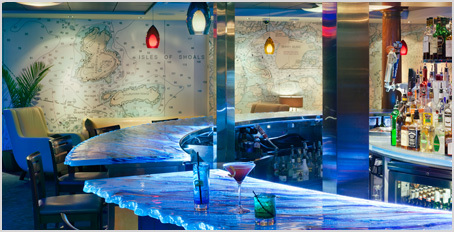 The bar at Martingale's Wharf in Portsmouth New Hampshire is nicely nautical with help from two Nautical Chart Murals. Still, over the years I started to get referrals from friends of my clients who saw my work firsthand, and slowly (read it S-L-O-W-L-Y) my nautical chart wallpaper murals began to catch on. Eventually, our murals began to be viewed in yacht clubs, restaurants, bars, hotels, and other public places. When that happened, I began to get calls from interior designers, and now about 75 percent of my work comes from designers. The common denominator is that almost everyone who orders has seen a nautical chart mural somewhere and, once seen, they love the idea. "Seeing is believing" certainly has proven true in our business. This spectacular mural of Vancouver Island is found in the restaurant at the Semiahmoo Resort in Blaine, Washington. Therefore, in this year, 2018, our business plan is to focus on getting more nautical chart wallpaper murals displayed in public places. Our goal is to have at our murals in three or more public places in each state along our coastlines. This offer will be good throughout the 2018 calendar year and will expire on December 31, 2018. Give us a call at 801-367-7945 or send an email to skippersteve@gmail.com and we will discuss the details! Make room for your kid's dreams! We have a saying for this time of year: Christmas is for kids! But, then since we too are kids in the 60 + range, our holiday wisdom doesn't really narrow things down. Still, this time of year causes me to reflect on Christmases long ago and when I was a kid, the best place on earth was my own bedroom. My mom let me choose the paint, the throw rugs for the hardwood floor, and the blue and green bedspread and matching drapes. I had a cool bookcase for my books and comics, a nice desk for doing homework, a chest for toys. I even had my own black and white TV in my room. What a room! In that little 10 x 12 room, I practiced my saxophone, did my homework, entertained my friends, and simply enjoyed having a place to call my own. But as a child, I dreamed of faraway places with tall mountains and blue ocean waves crashing on rocky beaches. I fantasized about visiting New Zealand and imagined I'd go there when I left home. Well, sixty years later, I still haven't made it to New Zealand, but if custom wallpaper were around, in the early sixties, this is what I would have chosen to be on my bedroom wall. I checked into unsplash.com for other pictures that might make a cool mural for a children's room and found plenty -- too many to show here. But try on a few of these and see if they might make it to your kid's room. How about one to encourage reading? Perhaps a future astronomer or astronaut might enjoy this unusual and colorful contemplation of the world and the universe becoming the world for this solitary observer. And for a little girl's room, where small girls see themselves in a magic mirror of fantasy, this one is priceless. Whether it is a nautical chart, or a novel photograph that you want to be made into a mural to make your child's room an unforgettable place to be and thrive, we are delighted to help make your image into a magnificent mural. Give us a call, and let's discuss what you have in mind -- for either your child, or you. Okay, it really isn't a battle, but merging two charts into one and doing so seamlessly is pretty close to a battle. Fortunately, my army of one, Kathryn Tyler is up to the task. This challenge came thanks to my client, Scott McLeod, who was interested in the area where the chart ended and made a slight overlap with another chart. You guessed it. Scott wanted the focal area to be in that overlap area. To those new to this blog, I have opined why a merge with two charts is so difficult. The short answer is that every chart is a flat, or two-dimensional representation of a curved surface. Some charts are more accurate in the middle and a bit distorted on the edges while the opposite is true on other charts. Point is, two adjoining charts don't easily match up as you can see in this second illustration. Kathryn has the ability to somehow make it all seamless. I have given her the title of "Princess of the Dark Arts" because I'm convinced she delves into some sort of magic to make a map merge possible. She actually scares me a little. One wrong move and I could be found on the Internet without pants and you would swear the photo was real. But so far, so good! Anyway, here is the finished mural, installed in Scott McLeod's home. Just another nautical masterpiece for all to see and marvel. Wainscoting helps frame the mural on this wall. The two charts are now merged and you cannot see where the merge took place! Maybe it is time for you to have a nautical chart mural of your own, made with nautical chart wallpaper's professional-grade wall covering. Give us a call at 801-367-7945 or drop us a line at skippersteve@gmail.com and we will talk about your project. I usually talk about sailing or nautical chart murals on this blog, but today, a change of pace. Now that Halloween and Thanksgiving are behind us, let's talk about Christmas. For our part, I put up the Christmas lights, and Linda is working on this year's theme of a Christmas tree, a woodland Christmas. Decorations of squirrels, foxes, chipmunks, raccoons, and deer peer out of the well-lit branches and pine cones. This Christmas promises to be one for the memory books! The older we get, the better Christmas is to celebrate. We keep gift giving to a minimum, but it is the lights, music, and memories of Christmases long ago that add the warmth to our celebration. If you are as old as me, you may recall Christmas in the Fifties. The sugar cookies mom would bake and I would help decorate were a big part of the fun. Tinsel was the main decoration on the Christmas tree, and to do it right, you would anchor one end of the tinsel strands in the pine needles and let the rest hang down straight. Done correctly, the tinsel would reflect the various lights on the tree, making it all the more magical. Break out your old photo albums, including the ones your parents and grandparents kept. After shutting down the TV, tablets, and smartphones, open those albums up one evening with your kids and grandchildren and talk to them about those wonderful days of Christmas when you were a kid their age. Show them pictures of you when you were learning all about how wonderful Chrismas is. Let them know about the Spirit of Christmas, and helping others less fortunate. For those of you of Christian faith, tell the story of the first Christmas, and how it all began away in a manger, long ago. For those of different faith, share your spirituality with your family. Most importantly, express the love of your family while you still have the opportunity. Time is fleeting. Who knows how many Christmas are left to celebrate for us? This season, Christmas 2017, teach your kids how to celebrate this joyous time together and have fun as a family. While counting our blessings this Thanksgiving, we would do well to remember the courageous Pilgrims that endured 65 days at sea on the Mayflower. They were bound for Virginia, but a storm that descended on them halfway blew them northward. You know the rest. Instead of landing in Virginia, they landed at Cape Cod. Being a sailor, I was interested in finding more about the Mayflower, and how crew and pilgrims managed to coexist for more than two months on the Atlantic Ocean. So I went online and found a very cool site that is geared to teaching kids about Thanksgiving -- and the Mayflower. Whether you are eight or eighty, this is a pretty cool synopsis of what the pilgrims went through, including a "tour" of the Mayflower. Did you know the helmsman of the Mayflower could not see where they were going? He was down below decks, taking his instructions from a "conner" who was on the deck above, shouting orders to the helmsman who moved a large stick called the whipstaff (today we would call that "stick" a tiller) which was connected to the rudder. While we at Nautical Chart Wallpaper take a couple of days off to be thankful and to be grateful to heaven for all our blessings, we wish you, our clients and potential clients, the very best for this holiday season. So now, when the family gathers together, why not bring your kids or grand kids over to your tablet, phone, or computer and using the link above, teach them a very colorful lesson about the Pilgrims and the ship upon which they sailed. Happy Thanksgiving from all of us at Nautical Chart Wallpaper and Nautical Walls! A Royal Map Collection Royalty-Free! One thing you always want to avoid in searching for a map or chart for your mural: copyright issues. This is one advantage of our nautical chart wallpaper. All the images from NOAA charts are free to use, with no issues of royalties nor copyright. Now, every so often, I'll get a request to do an antique map. But since NOAA doesn't do antique maps, I'm wary because it could be that someone may have augmented the map, and then copyrighted it. This practice is common with fishing maps where a fishing company uses a royalty-free map, then adds its fishing information into the map and copyrights it. To protect our clients from legal action, we will not accept fishing maps. And while antique maps can have copyright issues, thanks to one of our clients, Karl and Terri Lucas, I have just learned of a wonderful source for maps free from copyright and royalty encumbrances -- The New York Public Library Digital Map Collection. The list of digital maps they have is magnificent! And maps can be downloaded and used for free. I'll include some here, but realize this is just a tiny sample of what they have to offer. Remember the movie Big? The park visited by Tom Hank's character was Playland, in Rye, NY. Here is how an artist depicted Playland in 1927. And for those who long for Long Island, here's a cool antique map that shows Long Island in its entirety and also Block Island, Nantucket Cape Cod. I often waxed poetic about old cartouches and the art that appears on old maps. Here is a wonderful example of a cartouche with a historic map of Maryland, Virginia, and the Carolinas back in the days of the colonies. One thing about old maps. It is both amusing and instructive to see what the cartographer knew and mapped, and what they didn't know. This next map, made in 1741, shows a pretty empty Pacific Ocean. Notice Australia, only partly drawn, but by the pink coloring, it is evident that the cartographer thinks New Guinea is part of Australia. And as for the rest of the Pacific Ocean's archipelagos, well, that task will await yet another cartographer with better information. You will find old maps of cities (mostly New York cities) parts of the United States and some very cool Ocean maps. This is a site where you can spend several hours checking out their digital collection. And if antique maps relate to your interest, then, by all means, let's make a mural of your favorite old map for your wall. In the weeks to come, I'll do a blog about Karl and Terri's mural where they changed colors of their antique West Indies map to Benjamin-Moore's New York State of Mind Blue and Cloud White (an ivory color). I will wait until they get it installed, then share pictures. For the meantime, why not take a virtual trip to 42nd Street and 5th Avenue (the address of the New York Public Library) and check out the digital maps. Remember: Nothing is sadder than an empty wall. Fill your wall with an eye-catching mural from Nautical Chart Wallpaper. Let's begin with the famous quote of Rat to his pal Mole as he rows his boat in Wind in the Willows, by Kenneth Grahame.
. . . said the Water Rat Solemnly, as he leaned forward for his stroke. "Believe me, my young friend, there is nothing -- absolutely nothing -- half so much worth doing as simply messing about in boats." "One ship sails east and another sails west, With the self-same winds that blow. Tis the set of the sail and not the gale which determines the way they go. As the winds of the sea are the ways of fate, as we voyage along through life, Tis the act of the soul that determines the goal, and not the calm or the strife." And then there is my personal favorite by John Masefield, from Sea Fever. "I must go down to the seas again, to the lonely sea and the sky, And all I ask is a tall ship and a star to steer her by . . . "
I have found that sailors seem to have a quote that they revere and will quote and the drop of a Greek fisherman's hat to explain their enchantment with sailing, boats, and the sea. My recent client, Diamond Neeley, revealed his own favorite when we were designing his mural of south Florida. He wanted to have our cartouche on the wall, but he wanted the scroll to be much larger and have his favorite quote from Ernest Hemingway. So we at Nautical Chart Wallpaper redesigned a version of our cartouche to accommodate the poetry of sailors who want their favorite quote as an important component of their mural. Here is Diamond's Ernest Hemingway quote in our new cartouche . . .
. . . and here is how it appears in his mural layout. I bet that got the ship's wheel in your mind turning! Now it is time for you to think about what your favorite sea-going quote might be. Call Nautical Chart Wallpaper at 801-367-7945, or drop us a line at skippersteve@gmail.com and we'll help you immortalize your pearl of wisdom into a mural of your favorite sailing chart! In our fourteen years as Nautical Chart Wallpaper, we have not raised our price. Despite major fluctuations in the economy, our price is still $170 for setup and preparation and $10 per square foot. We'll do all we can to keep it that way through 2018. 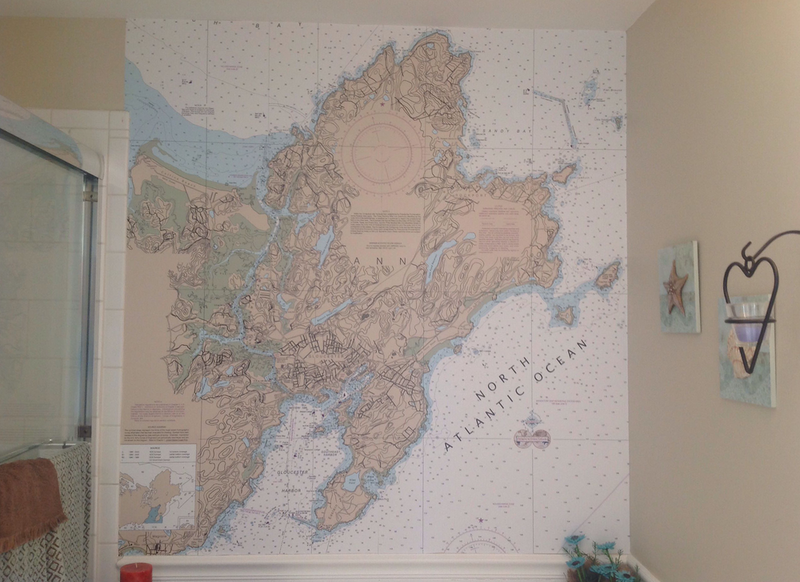 But even so, a nautical chart mural can take a bit out of your remodeling budget. So how can you have one of our magnificent murals and make it more affordable? The Restaurant at Madison Beach Hotel/Restaurant in Madison Connecticut used large beadboard with our color-treated murals of the Connecticut coastline. One solution might be to consider a chair rail, beadboard, or wainscoting for the lower part of your wall and install your mural on top. Subway Tile makes a nice surface in a bathroom. Note the bottom part of Lake Michigan above the cap and decorative nautical decor. As a rule of thumb: the cap, or top of the wainscoting/beadboard/chair, rail is 1/3 of the height of the ceiling. So if you have an eight-foot ceiling, figure the cap to be mounted 32 inches above the floor. A nine-foot ceiling will make the cap three feet above the floor, and so on. Sometimes a nautical feature such as this river makes a charming eye-path as it wends its way inland across the top of your beadboard. Your mural would be installed above the cap, which, of course, will save you 33 percent off the cost of the having the entire wall be a mural. But a word of caution. Chair rail, wainscoting, and beadboard all have their own costs. By the time they are installed, you may discover that you have not saved that much money and find yourself wishing you had ordered a wall-to-wall, top-to-bottom mural. Still, whether it is a full-sized wall mural or a mural that tops off the wainscoting, you still end up with a very attractive wall! Need help in a cost comparison? Contact us at 801-367-7945 or skippersteve@gmail.com for more information. Left this morning from the bell in Gardiner's Bay . . .
And I still have my hands on the wheel"
The interesting part of the song is that the names are of real places. Here is a portion of Chart 13205 where I have circled some of the names listed in bold in Billy Joel's lyrics. The takeaway message is that charts are for more than recreational use. Many mariners who struggle to make a living from the sea use their charts as a business plan. Their charts are also a way of keeping themselves safe as they face the many challenges of the sea. Now you don't have to be the skipper of Downeaster Alexa to enjoy nautical charts. Whether it is for business or pleasure, a nautical chart mural is certainly a conversation starter. Let us help you get one in your home or office. Call 801-367-7945 and we will help you get started!